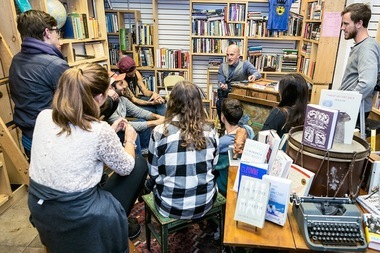 CUNY professor Geoff Klock teaches"Why Poetry is Extremely Important, Probably," a literature class taught this month at Hullabaloo Books in Crown Heights as part of Think Olio, a new "social learning" company founded in the neighborhood. CROWN HEIGHTS — Learn about travel writing, the importance of poetry or how to plan your life at a series of new classes hosted by a new “social learning” group founded by two Brooklyn locals. The company, Think Olio, has put on more than 50 classes since it launched last March, said co-founder David Kurfirst of Park Slope who, with business partner and Crown Heights resident Chris Zumtobel, came up with the idea for a roving set of diverse classes taught by a wide range of experts in local venues. “We started with a lot of living rooms,” Kurfirst said, adding that many of Olio’s first teachers came from Baruch College where he and Zumtobel met in a “social entrepreneurship” class. “It started in Crown Heights kind of coincidentally and then we realized it’s the perfect place,” he said. “There’s a lot of freelancers working there and those are the people who are really driven to keep learning. In particular, a series of classes taught by local business owner Michael de Zayas — owner of Little Zelda coffee shop, Hullabaloo Books, Nagle’s Bagels and the Two Saints cocktail bar in Crown Heights — have proven popular. Right now, he is teaching a three-part series called “Take the Time” about “planning our lives,” as the Olio description reads. The first part, on Jan. 11, sold out, Kurfirst said. “‘Olio’ actually means a miscellaneous collection of art and literature, so we really like to think of ourselves that way. [The classes] can be about anything,” he said. Prices for an Olio class range from a suggested donation to about $25 a class, but the goal is to offer options mostly between $10 and $20 so that it can function like an “alternative to the movies,” Kurfirst said. The group is looking for attendees for the class, of course, but also takes pitches from those who think they have a good idea for a subject to teach. Interested experts and teachers can apply through the company’s website. Currently, the majority of Olio classes take place in Crown Heights — at Hullaballoo, Nowhere Studios on Atlantic and Albany avenues and in area coffee shops — but a handful are scheduled in Williamsburg. Kurfirst envisions the idea spreading to wherever a group of people want to get together to learn something — and be more social — all over the city. “You meet your neighbors in a way that you might not have done before,” he said. For a complete list of classes, schedules and prices, visit thinkolio.org.